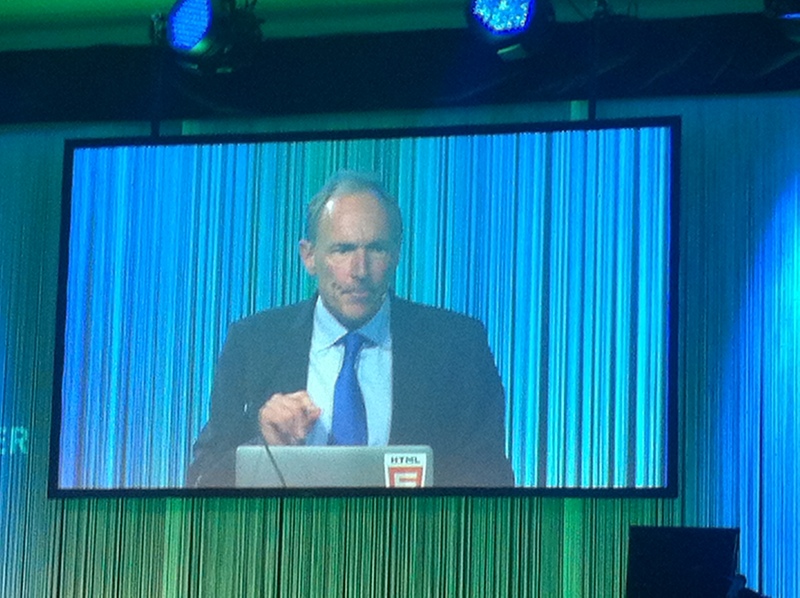 Yesterday I attended the award ceremony for Sir Tim Berners-Lee’s reception of the “Duttweiler-Preis”. For our non Swiss readers: Gottlieb Duttweiler founded Migros, today the largest food retailer in Switzerland, to put people and not money into the focus. At the time, “Dutti”, was loather and boycotted by the establishment. The Dutti-Prize goes to persons for “outstanding contributions to the well-being of the wider community and to a cultural, social or economic environment in which everyone can realize their potential and play an independent part in its development”. The price, which was previously awarded to such people as Jimmy Wales or Kofi Annan, was given to Berners-Lee for his invention of the WWW at CERN. Incidentally: The paper on Information management: A proposal was positively received by his boss Mike Sendall but rejected as “not innovative” by a the Program Committee of the Hypertext Conference. But Tim Berners-Lee not only invented the Web, he made sure it stayed open and accessible and I think this is in the spirit of Gottlieb Duttweiler. Had the web been “protected” by patents, we’d probably still crawl around on our digital knees in the Internet. The ceremony was a blast. Entering the large (and by the way publicly accessible) Park im Grüene, you were received and guided to the red carpet. The event assembled about 200 people in an atmosphere that invited informal exchange, I guess really in the spirit of Sir Tim. The ceremony was opened by John Cale, co-founder of Velvet Underground. Before the actual laudation, video sequences of interviews with people about the WWW were shown. In summary: Most people think the WWW was invented some in the fifties in the USA, and most cannot imagine a life without it. Yet, only about one third of the global population has access to the net. The laudation, presented by Harvard Prof Urs Gasser, stressed the social impact of Sir Tims invention on society. Afterwards we got a “Apéro dînatoire”, and more interesting conversations. So in short: This was an impressive event who rewarded a person following his inner drive. I think, this spirit is what makes the world go around, and the Internet such a fascinating place. And this is why we – here at SWITCH-CERT – want to keep it that way. Categories: News | Tags: Duttweiler-Preis, Net Neutrality, Tim Berners-Lee | Permalink.